Well, if it’s going to snow, it must be time for soup – bean soup to be precise. It’s hearty, filling, tasty, and has very little fat. It doesn’t make the snow stop but it makes it slightly more bearable. I use the recipe from HamBeens 15 Bean Soup, but there are bean mixes sold in bulk at the grocery, or just mix your own bean blend, with 20 ounces of dried pinto, lima, garbanzo, split pea, red, etc., beans to your liking. Put the beans in a large pot or bowl, cover with 2 quarts of water, and allow to soak at least 8 hours or overnight. Drain beans. Add 2 quarts of water and ham (you can also use low fat turkey smoked sausage, but it is about 1 gram more of fat/serving). I recommend a high quality ham slice, such as Kirkland, which has very little fat. Bring beans and ham to a boil and simmer uncovered for 2 ½ hours, stirring occasionally. I find I sometimes have to add a half cup of water periodically to keep the soup from getting too thick. After simmering, add onion, tomatoes, chili powder, lemon and garlic. Simmer for another 30 minutes. Add contents of seasoning packer or smoke seasoning and cook for 2 more minutes. 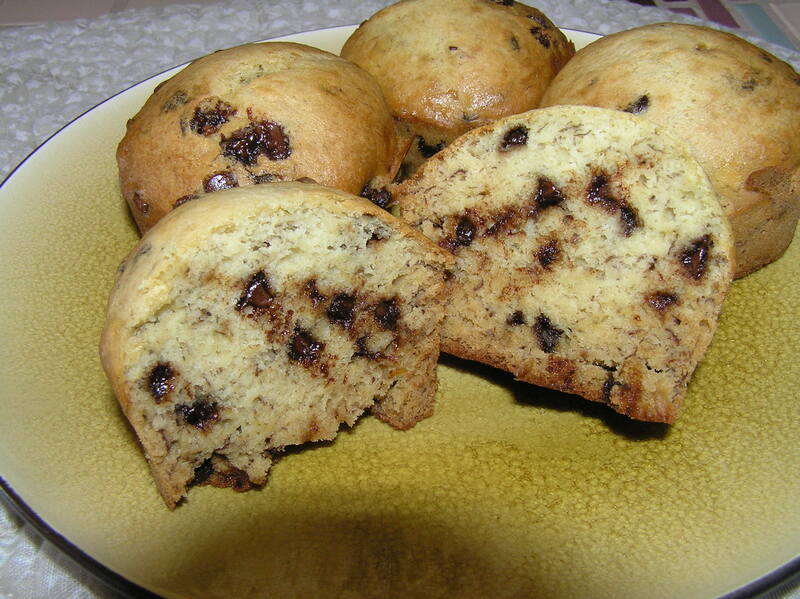 This makes 10 servings at about 2 grams of fat/serving. I find that the soup gets really thick, and I have to add a little water when I reheat it. The soup got labeled with the name of the contents, date it was made (so it doesn’t linger in the freezer forever), and the fat grams/serving. Then the soup was packaged for freezing – after I ate a nice hot bowl. 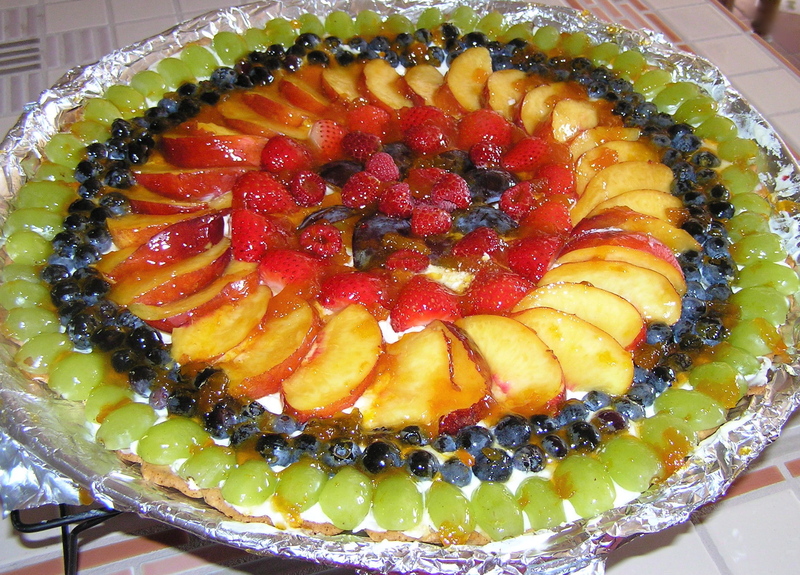 Fruit pizza was one of my standard potluck bring along dishes. It tastes good, is relatively easy to make, and it has a real Wow factor – rings of ripe fruit arranged on a creamy filling, glistening under a sweet glaze. 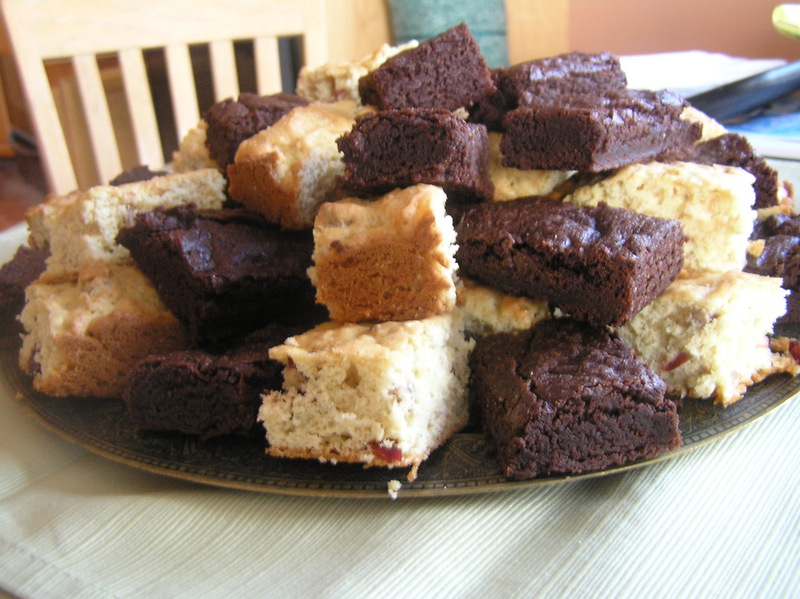 It’s one of those items that when you walk in carrying your offering, there are murmurs and exclamations of food lust as guests follow you to the serving area. But oh my, was it ever high fat – 2 tubes of those refrigerated sugar cookies, a pound of cream cheese – at least 25 grams of fat/slice. This flew in the face of two of my basic principles: never bring anything to a potluck that you can’t eat, and never bring anything that if there are leftovers, you can’t eat them at home. But it had such a Wow factor! This weekend, the fabulous photographer who did my picture for this blog was having his annual party at his garden on the roof of his downtown office building. It’s a great setting, with luxuriant plants (I have pepper envy just looking at his pepper plants), live music, interesting people, and good potluck food. Definitely time for a Wow offering, especially with summer fruit still coming on strong. So I lightened up the old stalwart, and it came out just fantastic. By the way, I didn’t have to be concerned about leftovers. The whole thing was gone in 15 minutes. The pizza is made in three steps: the crust that can be baked a day ahead if necessary, the cream cheese layer, and the fruit. 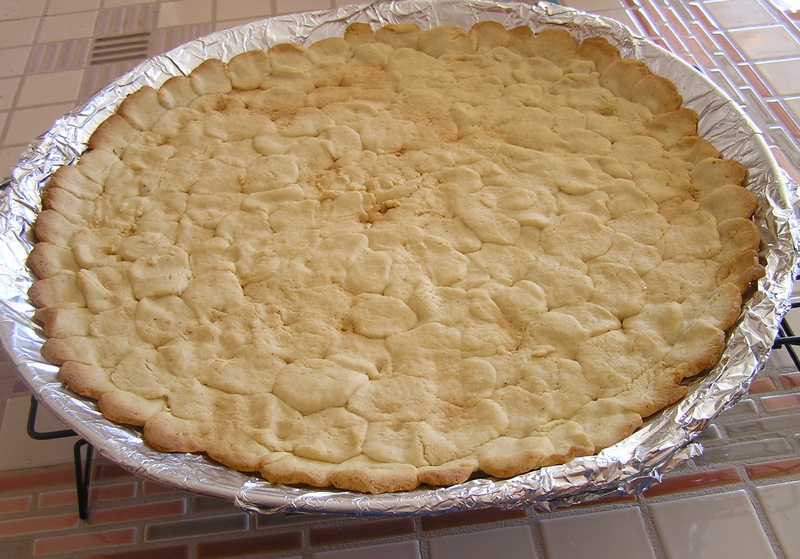 To make the crust: This is a sugar cookie recipe from Have Your Cake and Eat it Too that I used to take the place of the refrigerated cookie dough. This crust was actually much better than the refrigerated dough – it was thinner and crisper and tasted less chemical and more home-baked. This sounds recipe complicated, but it is relatively easy to do, and the dough can be made ahead and frozen. Melt the butter over medium heat and cook until the butter turns golden brown and fragrant. Be careful not to burn the butter (Browning the butter enhances the flavor, so that you can use less of it.) While the butter is melting, measure the sifted flour into a medium bowl. 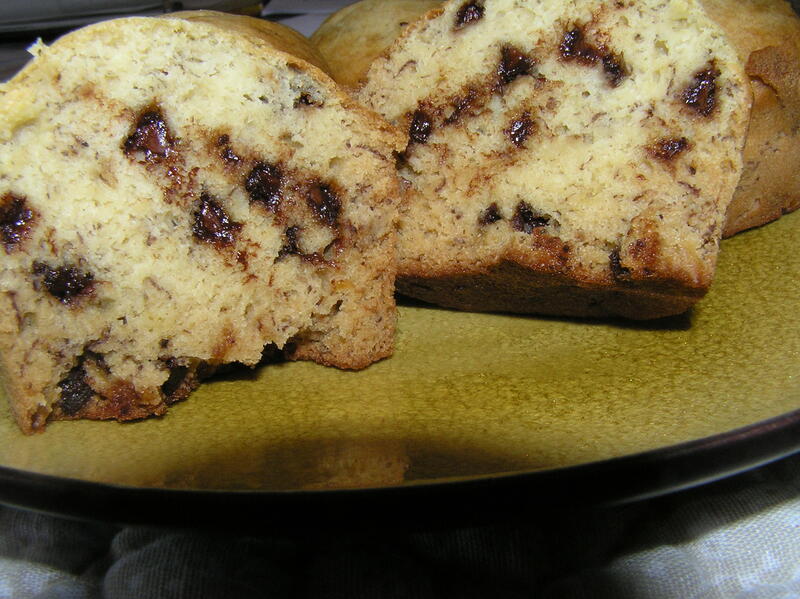 Pour the browned butter into a small bowl and whisk in 2 tablespoons of the flour. Place the mixture in the freezer until it is solid, about 10-15 minutes. Add the baking powder, salt, and confectioners’ sugar to the remaining flour and whisk together. Using the large bowl of an electric mixer, cream the granulated sugar and the cream cheese on medium speed. Add the egg, oil, vanilla, and almond extract to the cream cheese and beat well. Scrape the frozen butter mixture into the flour mixture. With your fingertips, pinch the butter into the flour, creating coarse flakes. Add the flour mixture to the egg mixture and beat with the electric mixer until well-incorporated, scraping the bowl once or twice. If the dough is too sticky, gradually add 1-2 tablespoons of flour. Gather the dough into three balls, then roll each of them out into a log about 1 1/2 to 2 inches in diameter. Wrap the dough logs tightly in plastic wrap and freeze for several hours. (You can freeze this dough for up to two months). Preheat the oven to 350 F. Spray a large pizza pan with cooking spray (my pizza pan is 15 inches in diameter. A somewhat smaller pan would work, but not one of those frozen pizza size pans. My pan is also old and a bit battered so I cover it with aluminum foil before I bake on it.) Taking one frozen dough log out of the freezer at a time, and using a very sharp knife, slice the logs into 1/8 inch thick slices. Starting at the outside of the pan, arrange the dough slices on the pan to cover the surface. Don’t overlap them. Don’t be concerned if there are holes in your crust, or if they don’t quite fill the entire pan. Once all the dough has been used, the dough on the pan will have defrosted and become pliable. Use your fingers to gently spread the dough toward the center of the pan and to fill in any gaps. The dough should be somewhat even throughout the pan. Don’t worry about it looking good, it will be completely covered when you assemble the fruit pizza.. Bake the crust in the middle of the oven for 15 minutes, or until it turns golden brown. Remove from the oven and cool on a rack in the pan until it is completely cool. At this point, you can wrap the crust and keep it overnight if necessary. To make the cream cheese layer: Beat all of the ingredients together with an electric mixer on medium speed. Scrape the bowl several times. Make sure that all the lumps are gone. Fruit Note: It is hard to give an absolute measure for the fruit, because it depends on the size and type of fruit you use. I usually prepare quite a bit, and use what is necessary. You can use any kind of soft, ripe fruit – I don’t think apples or pears would work unless they are cooked before hand. I have made this with alternating circles of red and green grapes, used peeled kiwi sliced and pitted halved cherries, and used canned pineapple pieces and mandarin oranges in the winter when fresh fruit and berries are scarce. The selection is up to you. Cut larger fruit, like nectarines or peaches thin, halve grapes and strawberries. This will make the pizza easier to slice. Assembly: The fruit pizza can be assembled a couple of hours before you serve it, but it doesn’t hold for a long time, because the crust will get soggy. Using a spatula, spread the cream cheese mixture on the cooled crust, spreading it to the edges. Carefully arrange the fruit in concentric circles starting with the outside ring which should come right to the edge of the pizza. Fruit should touch the adjacent piece of fruit, so there is not much of the cream cheese layer showing. When the fruit is arranged, melt the apricot jam (or preserves) until it becomes liquid. Some people like to strain the jam to remove the larger pieces, but I usually don’t. Gently brush the jam over the entire pizza, forming a glaze on the fruit and filling in any gaps between the fruit. Refrigerate the pizza, uncovered, for 20 minutes to allow the glaze to set. This is especially important if you are going to wrap it to take somewhere. Slice with a pizza cutter or a sharp knife. 12 servings with 6 grams of fat/serving, or 16 servings at 4.4 grams of fat/serving. The primary reason I rush out to buy buffalo is to make buffalo pot roast. There is something about buffalo roast – a sweetness or a richness, that makes a really fine pot roast. Now I confess that I don’t make an elaborate pot roast with browning and simmered vegetables and the like the way my daughter does. She makes the true, old-fashioned pot roast. I’m sure that you could make buffalo with that recipe, too. And it would taste very good, indeed. I, however, make the working woman’s quick, easy, and delicious pot roast – you know, the one with onion soup. And everyone raves about it thinking that I have worked my little fingers to the bone preparing this rich and lovely dish. I made it last year to feed the assembled multitudes at Passover, which led to a heated discussion of whether buffalo was kosher (although none of us actually keep kosher). I referred them to the Kosher Buffalo site, and verily the rules of kashrut (that’s the rules of what makes something acceptably kosher) state that if the beast has cloven hooves and chews the cud, it is acceptable. Buffalo hooves are cloveneth and the big beasts cheweth, so they’re ok. Anyway, I made 9 pounds of buffalo pot roast this time. This recipe makes less, but you can double it or even more if you’ve got a big enough pot. Plan to make this ahead of when you want to eat this. Place the chopped onion in the bottom of a large pot, such as a Dutch oven. Place the buffalo roast(s) in the pot on top of the onions. Sprinkle the onion soup mix over and around the roasts. Put the mushrooms on top of the whole thing. Add water half way up the sides of the buffalo roast. Add Kitchen Bouquet to the liquid until it is the color that you want it to be. *If you’ve never used Kitchen Bouquet, it is a browning and seasoning sauce containing caramel, and a vegetable base of carrots, onions, celery, parsnips, turnips, salt, parsley, and spices, and is commonly available in supermarkets. It is a true friend of the sometimes lazy cook. 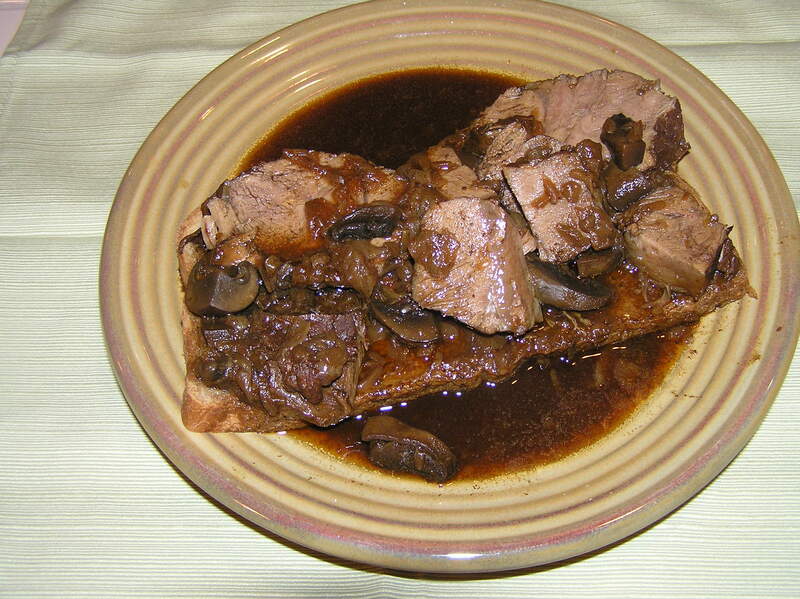 Bring the pot roast to a boil over high heat, lower the heat to a simmer, and cook for 4 hours, turning the roast occasionally, and making sure that the mushrooms are immersed in the liquid. You read correctly – you haven’t browned the meat or sautéed the onions first. You don’t need to. 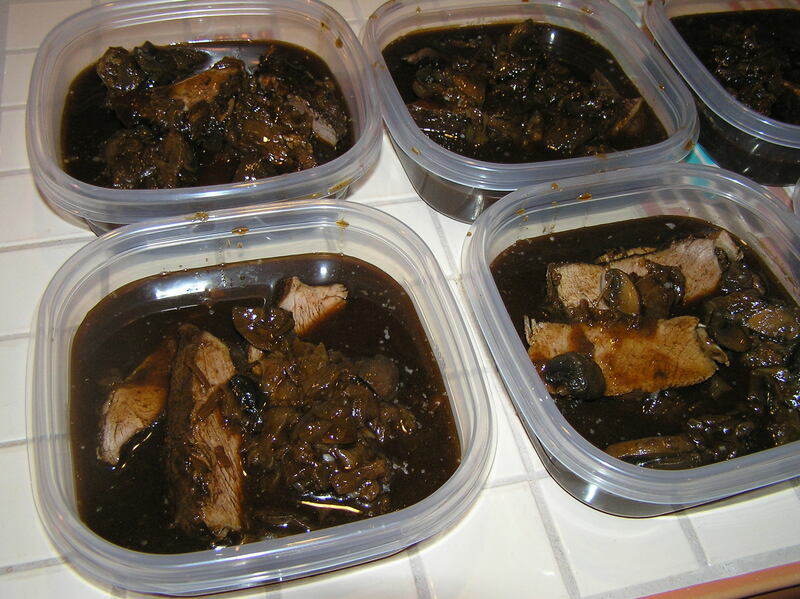 When the pot roast is done, remove it from the liquid and wrap separately. Remove the onion and mushroom solids, which have cooked down to a glorious soft mass, and store them in a separate container. Pour the liquid into a separate container. Refrigerate for 4 hours, or overnight – or even for two days as I did because I was busy. 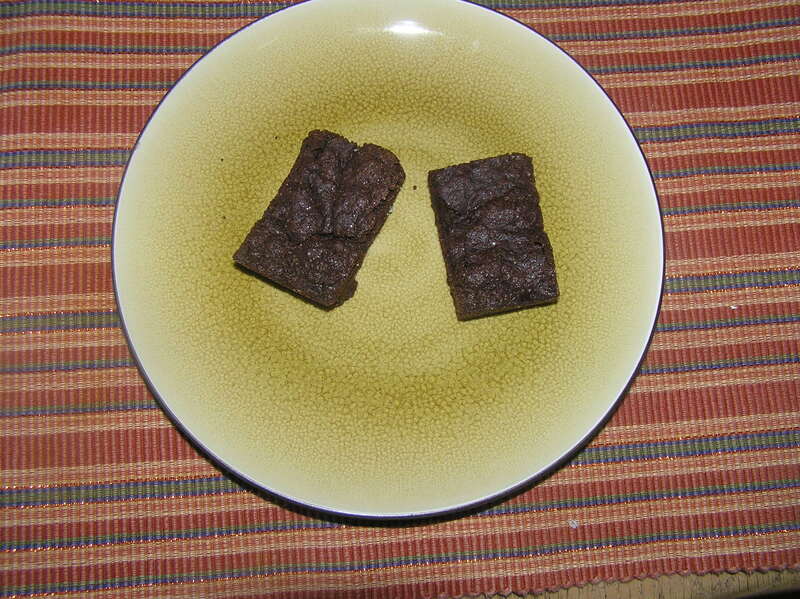 Remove the fat – there won’t be much – from the surface of the liquid before reheating. To serve, slice the meat thickly and reheat in the liquid with the reserved vegetables for about 20 minutes. A serving of 6 ounces of meat and gravy has about 4 grams of fat. Variations: You can cook carrots with this, although they cook down so they’re not really distinct. I often add vegetables, such as green beans, when I’m reheating the pot roast. You can thicken the gravy when reheating it by adding 2 teaspoons of cornstarch mixed into a tablespoon of cold water and stirred into the gravy. Cook until the gravy thickens and is clear. Usually, I serve the pot roast over noodles or rice or even couscous, but I was too lazy to do that, so I made and open face pot roast sandwich on some nice whole wheat bread. Pot roast ready for the freezer in 6 ounce servings, with gravy and solids added.